Outside of marriage and the birth of a child, selling a business may be the most important life event an entrepreneur ever experiences, representing the financial reward from years of hard work, vision, and determination. And like anything that important, you want to do it only once, and you want to do it right. 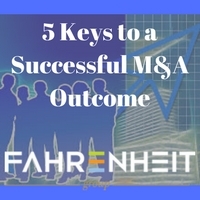 As an investment banker who has sold dozens of middle market companies over a 20-year career, I can share with you five keys to maximizing the outcome from an M&A process. M&A Markets–the more buyers there are looking for deals, the better your business will be received. Middle market deal activity is currently at record levels, fueled by cheap debt and an overabundance of private equity capital raised that must be invested in private companies. It is definitely a seller’s market. Your Industry–do you participate in an industry that is experiencing headwinds or tailwinds? Is it growing or shrinking; the wave of the future or an echo of past glory days? Just as a rising tide lifts all boats, so too does a favorable industry raise the valuations of its participating companies. Your Business–perhaps the toughest to objectively assess, you want to bring your company to market when it is hitting its stride. Ideally, the financial metrics of growth and profitability have been strong and improving for the past several years, and the company is posting solid year-over-year growth. Most importantly, you want the outlook for the next several years to be bright. While some people may find success in selling their house using a no-agent, “For Sale By Owner” strategy, going it alone when selling the culmination of your life’s work is not advisable. You need to retain the services of experienced professionals, each with their own area of expertise, to join your team. Examples include an intermediary (business broker or investment banker, depending on the size of your business), an M&A attorney (not your general practice lawyer), accountants, tax experts, estate planners, and wealth managers. The amount of risk that potential buyers or investors perceive in your business will be a significant factor on valuation. Therefore, look critically at your business to identify and mitigate areas of risk as far ahead of your anticipated exit as possible. Examples of business risk include customer or supplier concentration (ideally, neither category should have an account representing more than 25%), high levels of one-off revenue (versus recurring), and lack of bench strength at key positions in the organization. Addressing these and similar areas of risk will eliminate any excuses that potential buyers might have to back out of a deal or try to re-trade on price. Private business owners often take a “tax minimization” approach to operating costs, preferring to run as many expenses as possible through the company to lower taxable income and thus reduce their tax bill. This approach is exactly contrary to maximizing your business’s value, since buyers look to operating cash flow as the basis for setting the purchase price. An M&A advisor will help you comb through your financial statements to identify non-recurring and extraordinary expenses that can be justifiably excluded, thus increasing the cash flow presented to buyers. And since the purchase price is typically determined as a multiple of cash flow, every $1 of increased cash flow could mean $5 or more in purchase price. No one should pressure you to sell your business, especially a high-octane intermediary who tells you that you’ll “miss the window” unless you sell now (see #1 above on timing considerations). That said, when you have determined that the time to sell has come, work with your advisor to consider the type of transaction that is right for you. Are you interested in selling a majority stake, or only taking on a minority growth investor at this stage? Should strategic buyers be contacted, or does the thought of becoming a division of a larger corporate entity outweigh any premium value they may be able to pay? Your M&A advisor can help you understand all of the pros and cons, as well as provide you a realistic, high-confidence range of expected value for your business. And once you have decided on a process and are comfortable with the expected valuation range, mentally commit to achieving a successful outcome and reaping the financial rewards of your hard work. Jonathan Brabrand is a Managing Director at The Fahrenheit Group and brings a unique skill set to the firm based on his 20-year career in middle market investment banking. Having represented dozens of companies in successful sale processes during his tenures at premier firms such as Harris Williams & Co. and BB&T Capital Markets, he now provides independent pre-transaction advisory services to entrepreneurs, business owners, and Boards of Directors to help them evaluate and prepare for future liquidity events, including M&A transactions, leveraged recapitalizations, or capital raises. He also works with executives to hone their business plans, develop acquisition strategies, and refine their company’s core value proposition. His experience-based advice on liquidity alternatives, timing, valuation, and overall transaction readiness focuses solely on the owner’s best interests and lacks the inherent bias from business brokers and investment bankers whose ultimate goal is to secure an advisory mandate.